This Father's Day, think about getting your father (or father-in-law or father figure or father of your children or father of children you are fond of) a gift that he'll enjoy as well as directly or indirectly provide some food which you'll get to enjoy. Here's a dozen ideas that I thought of. 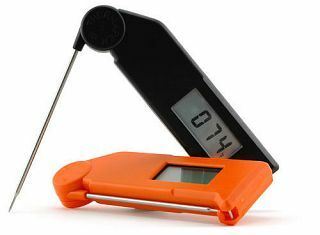 If he loves to grill or roast meat, then the Thermoworks Thermapen is a great choice. Capable of reporting an approximate reading in a second and an accurate one in four seconds, the Thermapen is the fastest instant read thermometer on the market. The ultra slim tip also leaves a much smaller hole, allowing a minimum of precious liquid to escape. It is also useful for checking the temperature of just about anything (cold water, hot water, boiling water, hot oil, candy... just don't use it to test human body temperature - the tip is sharp). What gift could be more fun than something that's branded with CookingForEngineers.com? Choose a T-shirt, apron (or other apparel) or a mug from a tiny selection (wish I had time to expand the line-up) of designs, including the ever popular RTFM series. Want to get him something that lasts for more than a couple years? How about something that lasts more than couple generations? All-Clad Metalcrafters makes some amazing cookware that is a real pleasure to cook with, conducts heat extremely well, and lasts and lasts. Almost all of All-Clad's pots have a thick aluminum inner layer that evenly distributes heat and are clad in stainless steel to provide a non-reactive cooking surface. I swear the steel on the All-Clad must be different than other clad cookware because I'm able to get a perfectly clean surface extremely easily with some light rubbing with Barkeeper's Friend. (Other cookware seems to take a lot more work to achieve the same result.) I love my All-Clad, and I'm sure the father in your life will love to have some too. 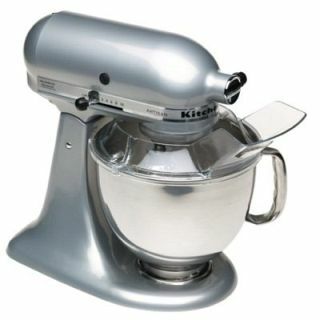 The power tool of the kitchen is the KitchenAid Standing Mixer. The most popular line, the Artisan, comes in a variety of colors and packs a powerful 325-watt motor capable of driving a variety of accessories. In its basic configuration, you can whip, beat, and knead. In addition to the normal uses (whipping cream, making cookie dough and cake batter, and kneading pizza dough), I've used it to make butter, whip up marshmallows, and mix meat loaf. Not enough uses? Additional accessories can be attached to harness the motor as a powered meat grinder, food mill, citrus reamer, food slicer and shredder, pasta machine, and more. Some guys loves knives. The Global G-2 and the MAC MTH-80 are two examples of excellent Japanese chef's knives under $100. The angle of the edge of these blades are shallower than western chef's knives which allow them to achieve a razor sharp edge that slides effortlessly through your veggies and meat. If he's already got a set of nice knives, he'll want to be able to sharpen those knives. There is no more satisfying way for a hands-on man to sharpen his knives than with a set of high quality waterstones that allows him to put the keenest edge on his knives possible. If he's in a hurry, the Chef's Choice 120 Knife Sharpener is one of the best electric knife sharpeners designed for home use. Does he have a grill? Is it from the 70's? Get him a new Weber! 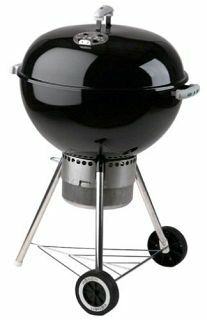 The classic kettle shape is still one of the best designs by Weber and the 22.5-in. provides ample space to grill just about anything he wants from burgers to chicken to a prime rib. With a peak power of over 2 HP (1500 watts! ), the Vita-Mix blender is not what most people think of when they hear the word "blender". It's equipped with a variable speed dial that let you easily find that sweet spot for blending perfectly. He'll never actually use it to make ice cream or boil water in under ten minutes just from the friction of the blades spinning through the liquid, but he'll love to brag about it to his friends. Alton is the king of geek cooks. He's got a KitchenAid mixer with flames painted on it, has rigged up a pepper grinder to run on his power drill, and built a ceramic smoker with $42 worth of materials from Home Depot. 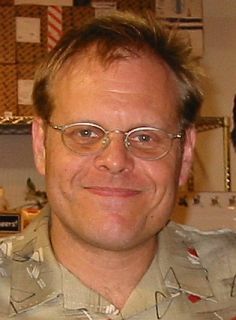 For many guys, his show, Good Eats, is the only cooking show they'll bother watching. Your father will definitely appreciate any of Alton's DVDs or books (2 cookbooks and one book just on kitchen gear). Got a father whose really into precision? Or doesn't like to bake because he can't deal with measuring with cups and straight edges? My Weigh makes the best digital scales I've used in the kitchen. With an ultra fast response, he'll be able to pour his ingredients and stop as soon as the scale registered the correct weight. No more messing with different measuring cups. 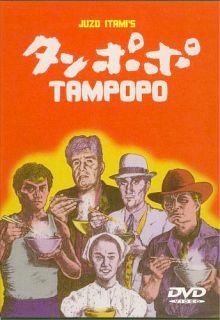 This one isn't for every guy, but if he loves movies and he loves food, then there's a god chance he'll enjoy Tampopo, one of the greatest foodie movies ever made. In this Japanese movie, the main plotline follows a truck driver (who fancies himself a cowboy) decides to help a beautiful restaurant owner to transform he dying business into the best ramen house in the city. Short vignettes celebrating food in a variety of humorous (and sometimes bizarre) ways are sprinkled throughout the movie. As a bonus, Ken Watanabe (The Last Samurai, Batman Begins) plays a young man who learns the proper way to eat ramen from a venerable master. I was going over the Father's Day list, thinking that in two weeks I will actually be a father. I coveted the Weber grill, I nodded in approval at getting anything Alton, but then I hit Tampopo. I thought I was the only one who ever thought anything of this movie. I was afriad to share my love of this movie in public for fear of being thought a freak. But I may just muster the courage to find it on DVD and strap my friends to a couch to watch it. Thanks for validating my insanity. Sure would be nice to know what RTFM stands for????? It's a computer engineer/programmer acronym that basically means "please read the documentation" but in much more crass and harsh language. It's both a reply of frustration as well as a little bit of a joke and almost never said in it's expanded form. Urban dictionary has a good recording of it's literal meaning. First,I like your website. My comments pertain to the endorsement of All-Clad cookware. I retired after 23 years in foodservice doing everything from fine dining to catering. 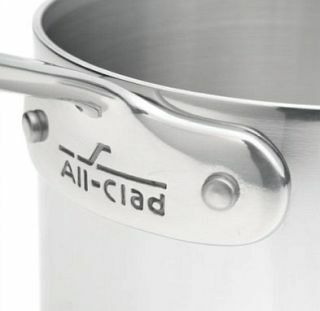 All-Clad is well made, looks super - but it's not my near my first choice for cookware regardless of price and celebrity endorsements. I without bias recommend that the cooking enthusiast/home cook try out Sitram cookware before laying down the green for All-Clad. It's not only Sitram that produces super cookware from France, but it's a great place to start. Sitram cookware has a lip on the pots and pans that makes drip-free pouring easier (All-Clad is really lame here), Sitram cookware cleans up fast (not even an angry dishwasher could wreck it), it is lighter (easier on the wrists over time), and the the price is right. Some of the pieces of All-Clad I received from my employers and well-meaning friends who knew my profession, now sits in a cabinet collecting dust - they're sure pretty to look at but not my tool of choice. My past days of catering were often in the LA/Miami/NYC homes of people with serious wealth (some of whom are well known on TV and the Silverscreen), and I often saw All-Clad in their beautiful custom kitchens looking new and unused, much as you'd find their 'extra' luxury car parked in a garage stall unused. All-Clad makes nice cookware for a 'stager' to use when selling a million dollar home - people with serious green read those Robb Report-type magazines and believe it's what they must have. For those of us with more sense than money - go with more affordable cookware like Sitram. Disclaimer - I have never been paid to endorse any cookware, Sitram or any other. I've never used Sitram... I'll have to go get myself a piece or two to try out. Of the stainless clad cookware that I've used regularly - Tramontina, Calphalon, Anolon, Farberware, and All-Clad, I've found that All-Clad out performs the others. Thanks for your response. 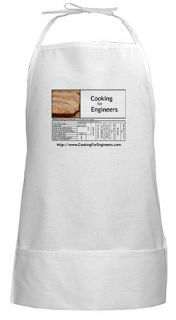 http://www.cookingforengineers.com/ has been mentioned to an engineer acquaintance of mine - I'll find out what she thinks as some point. Give the Sitram Profiserie pieces a tryout - this is the home cookware line I've used for many years. I can't speak to the other Sitram lines. In my catering days, when I lost a Sitram Profiserie pot or pan it wasn't the end of the world - I could replace it for less $$ than high-end cookware, but even used strictly in the home kitchen environment it is just easier to sling around because of the reduced weight. Some of use have carpel tunnel issues already! You'll note: Sitram has a lip on their cookware rims which enable easier pouring without spills. True, All-Clad has a wall thickness that excels at holding/transferring heat - hence the extra heft. Nice, but far from a necessary attribute for cookware used by the largess of cooks. As you probably know, the Europeans produce lines of cookware that are supremely beautiful, with serious heft as well (several eclipsing All-Clad's in appearance) - but you'll pay dearly for them, especially with the US/Euro currency exchange rate. IMO Sitram Profiserie is a fine set for most home cooks (or even professionals). 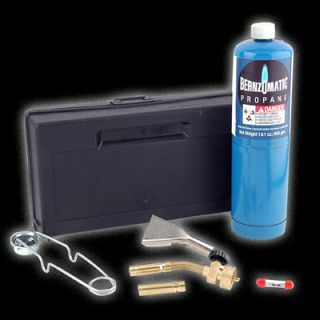 The Profiseie set makes a practical, lasting gift that will be used for the long term. These cookware sets pop up on eBay from time to time.